Pack Products will look like this for your customer on the front end. There are 2 steps in creating a Pack Product. 2) Create the product as usual and select the new Group Attribute once it has been confirmed your requested Group Attribute is created. To do this you will need to provide information to the Ecommerce team. Note you can have as many Attributes as you would like. As long as they are provided to the Ecommerce team you can set this up. Once you have received confirmation of the Attributes have been uploaded for your Organisation you can then proceed as you normally would to create the product. When you create your product as usual you will have the option of selecting 'Attribute Group'. When you click the drop down your new Attribute Group you have requested will be sitting alphabetically in the list. Once selected and have filled out the correct information press save. 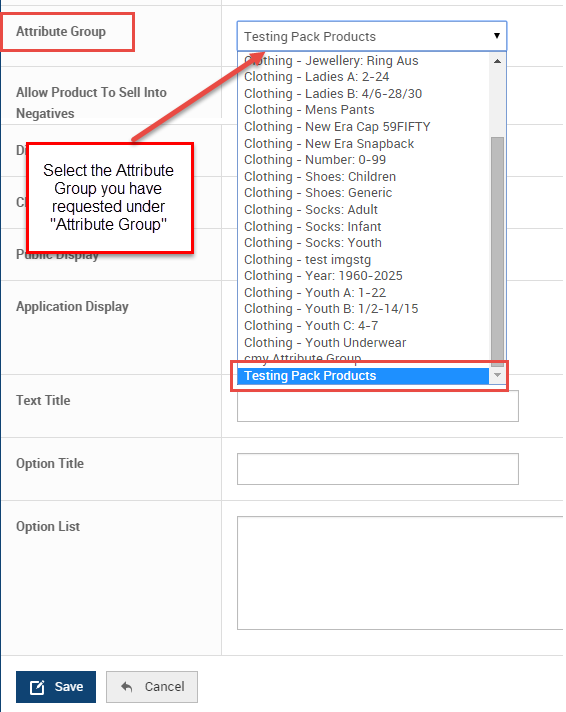 Now you have created the product with the Group Attribute selected you need to apply the attributes to the SKUs. You will now see that there is additional columns for your selected Attributes. Enter in your combinations to ensure your customer can select the product. Note you will need add all the combinations you require so your customers can select on your shop.